If you're going on holiday anytime soon, you're going to want to read this! There's nothing quite as exciting as being on holiday, far away from the stresses of normal life. However, getting there with all the kids and necessary paraphernalia in tow can be a nightmare! With a bit of planning and some clever thinking smooth sailing is not impossible. We searched high and low for tips that are guaranteed to save your sanity on the trip. Visualise how your trip will unfold, and try to pack clothes for your baby that she'll need (and that fit). 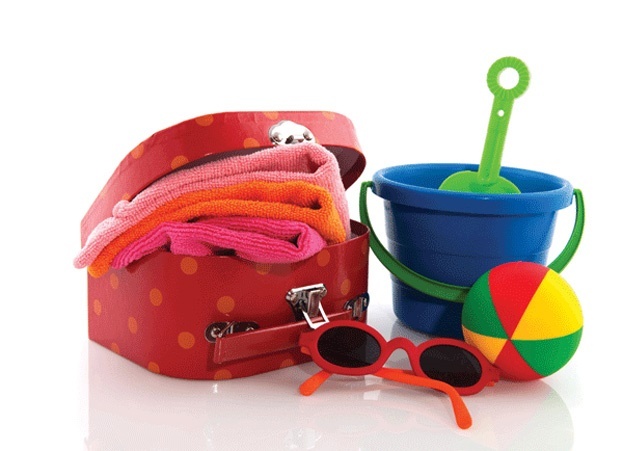 Write down everything you think you'll need on the holiday, including the items you think are quite obvious like toothbrushes, underwear and nappies, and tick the list off as you pack. While it's quite easy for you to adjust to unexpected changes, it's not quite as easy for your baby. You may be expecting sunny weather at the beach, but weather forecasts can be unpredictable, be sure to pack a variety of clothing. If you're travelling by plane, it's important to bear airline baggage restrictions in mind while packing. Check with the airline about the restrictions and extra charges that might apply so that you can pack accordingly. This includes the restrictions on the contents of carry-on luggage, such as your nappy bag. Be sure to pack a simple first aid kit that include any medications your child is on, as well as some paediatric paracetemol and a burn kit. Pack a few childproofing items so that you can ensure your accommodation will be as safe as possible. Simple solutions, such as electrical outlet covers for example, are easy to transport and ensure safety away from home. Get you baby, and yourself, ready for the road by taking a short day trip away from home. This was she gest to spend a longer period than normal on her car seat, which helps her get used to it, and you get to suss out what works and what doesn't when it comes to what supplies to take with and how long your child can stay seated before needing a pit stop to stretch her legs. Travel with children rarely works out as planned, no matter how many lists you make. Prepare yourself to accept any unexpected changes and to face challenges with a sense of humour. Keep your itinerary simple to allow for this. If you're flying, book seats away from your partner so that one fo you can sleep while the other has the baby and then swap so the other person gets some rest too. Pay your local library a visit before your trip to pick up a few children's books. Surprise your toddler with these books once you're on your way so they hold her interest for a while. Make usre you've chosen a relaxing destination that is used to young guests. Some of these even allow children to stay for free and have special activities for the little ones. Try to plan your departure around your child's sleep routine. For example, if you're driving down to the coast and you leave in the early hours of the morning, you'll have quite a stretch of road behind you by the time she wakes up. Likewise, if you're travelling on a plane in the evening, your baby may just fall asleep once the plane has taken off and sleep during most of the flight, and she'll be less likely to fuss. Distractions are key to keeping your little one busy, and the more you have, the better. Stock up on a few cheap thrills like stickers, coloouring-in books and crayons, small toys and puzzles. Wrap some of these up in bright paper before you leave and give your child a "present" every once in a while on the trip. This way you ensure she doesn't get bored. Be sure you take along plenty of drinks and healthy snacks for your toddler. Small children get dehydrated easily, so a few sippy cups of diluted juice and some water are a must! Snack ideas that work are cucumber and carrot sticks, small bags of wholegrain cereal, pre-cut fruit and biscuits. Messes are bound to happen, so pack an extra outfit into the nappy bag and bring one along for yourself. Comfort is key, so go for layers of clothing that you can take off or put back on as the temperature fluctuates. This goes for you too, mom and dad. These handy gadgets attach to the back of your headrest in the car, or can be handheld, and play DVDs that will keep your toddler entertained for hours. Take along a few of her favourites for a sense of familiarity on the long road. A sing-along CD is also a good idea. This is especially handy if you're flying. Keep all you necessities in a backpack, which leaves your hands free to deal with your child and to reach for travel documents and whatever else is needed. That little body has a lot of pent up energy in it, so stopping regularly for your child to strecth her legs is very important. Plan to make stops every two hours or so and take along a ball that she can run after for a few minutes. Use these opportunities to change nappies or take little ones to the loo too. Games that focus in spotting objects that are zooming by can bring on motion sickness. If you're travelling with a recently potty trained toddler, consider using pull-up nappies for the drive or flight to avoid any unnecessary accidents. Never turn down a drink for your child when you're flying. Unopened juice cartons can be saved for later in the flight (when the flight attendant may not be able to serve drinks). If you'll be renting a car for the trip, be sure to rent a car seat as well. Book this in advance and be sure to request the same type of car seat your child uses at home- a five-point harness or booster seat, for example. Once you arrive at your destination- whether it is a hotel, holiday flat or even granny's home- start looking for possible safety hazards in your new, temporary, home. Cover the electric outlets, tie up loose blind cords and zip up loose electric cords. Your children will probably not be on the same schedule on holiday as they're used to, no matter how hard you try to stick to the routine. Make sure everyone is well fed by eating smaller meals and snacks more often.